LONG BEACH, Calif. /California Newswire/ — Art-In-Relation (A.I.R. ), Children’s Theater of Long Beach (CTLB), and The Scottish Rite Cathedral announce a wonderful partnering of resources and talent for a 2017 holiday musical production of “The Christmas Carol.” Plays Dec. 15, 16, 21, 22, 23 at 8 p.m. and Dec. 17 at 2 p.m. at the Ernest Borgnine Theatre, 855 Elm Avenue, Long Beach, CA. The two companies, A.I.R. and CTLB, both were founded in 2013 and found themselves on similar trajectories as they were both producing musical theater at the historic Ernest Borgnine Theatre in Long Beach, Calif. Two long-time friends, Jonas Sills (A.I.R.) and Sean McMullen (CTLB) reunited under the advisement of Tim Cable, long time Long Beach resident and manager of the gorgeous venue. It was a natural partnership as each entity is primed to flourish with their talents. Jonas Sills serves as director and music director for this show and is thrilled with both the partnership and the production. Tim Cable is thrilled to return to this production to play the leading role of Scrooge after playing the role in 2014 with A.I.R. He also serves as executive producer. Sean McMullen, a multi-capable theatrical force, serves this production as technical director, handling sets, costumes, lights, sound, and all things that have to do with production values. This production of “The Christmas Carol” is a unique version written and conceived by Ray Buffer, producer emeritus for A.I.R. It combines a very genuine adaptation of the Dickens classic and infuses appropriate era Christmas carols as well as original music including the sweet, singable title song “The Christmas Carol.” The music was orchestrated by Robert Gross. It features a large cast of talents listed here in alphabetical order; Ciara Adise (Isabel), Tim Cable, (Scrooge), Meredith Carter (Edwina), Mary Frances Conover (Elizabeth), Beverly Crain (Soloist), Ferdie Directo (Fezziwig), Colin Eaton (Boy Scrooge), Pamela Flores (Youth Caroler), Kelly Lynn George (Regina), Trevor Gordon (Simon), Danelle Jaeger (Maggie Cratchit), Todd Johnson (Marley), Jordan Johnson (Caroler), Philip McBride (Bob Cratchit), Hannah McMullen (Past), Rebecca Olejar (Victoria), Jon Peterson (Present), Grant Ramos (Tiny Tim), Oscar Ramos (Caroler), Shea Ruhlin (Youth Caroler), Griffin Runnels (Young Scrooge), Amy Shu (Olive), and Heidi Sills (Mrs. Fezziwig). Thrilled to be able to bring this wonderful story to the community, this partnership is dedicated to bringing this show to various local charitable organizations as well as the general public. 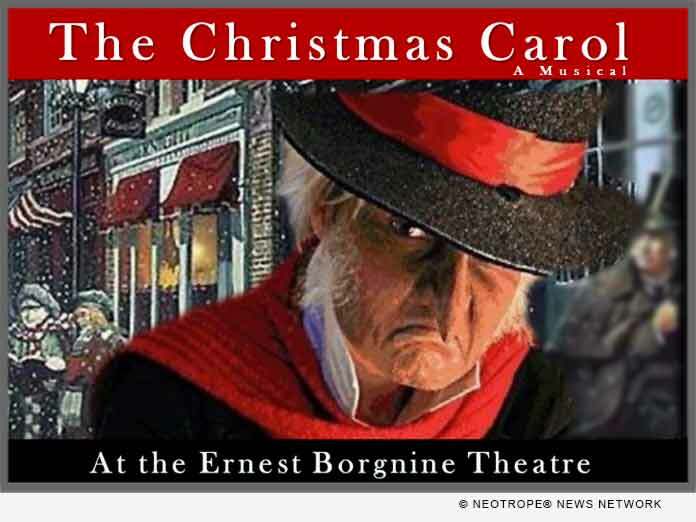 “The Christmas Carol” plays December 15, 16, 21, 22, 23 at 8 p.m. and December 17 at 2 p.m. at the Ernest Borgnine Theatre, 855 Elm Avenue, Long Beach, CA. There is plenty of free parking. For Google Maps directions, visit: https://goo.gl/maps/74qxg8gQRtR2 or the venue website: http://www.ernestborgninetheatre.org/. Tickets are available at http://www.artinrelation.com/ or by calling 323-320-2898.